Experienced and amateur rafters know that the UK has some of the best water for this type of adventure. However, the key to booking the very best trip is to do your research so that you can get the best possible experience. One website to visit is www.ukrafting.co.uk. This website offers plenty of options to meet the needs of any rafting enthusiast. Check out the website and you will see links to book weekend or day trips. Additionally, this site is perfect for finding the very best training in the UK. Trainers will guide you on the best ways to navigate tough stretches of whitewater so that you and your party remain safe and informed. 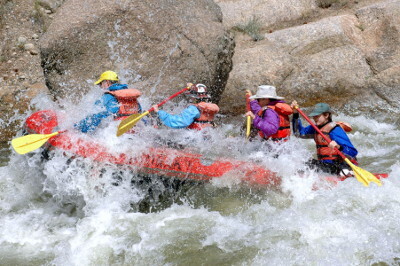 Corporate team building is a great reason to book rafting trips. This type of activity serves to help co-workers to connect with others, and to build trust both inside and outside of the office. The website above will take you to links that offer great package deals for large groups of people from various industries. Book well in advance and offer the trip to all corporate folks who might be interested. The since of adventure that everyone will experience will carry over to success once you are back on the job. Book a corporate rafting event and see how it translates to better working relationships. The lower Tryweryn is a great choice for rafters of various skill levels. It provides challenging stretches of whitewater that require skilled navigation during certain times of the year. Less skilled rafters should not book trips during the rainy seasons, however. This 4km run toward Bala is ideal for those who love to seek the rafting trip of a lifetime. The best part about this stretch of water is that it allows for different types of crafts. They include smaller rafts that seat a couple of people, to much larger rafts that seat 4 to 6 people. Some people choose to take a kayak or canoe instead. A UK rafting trip is just around the corner. All you have to do is find the best situation to achieve the perfect experience, and to find the best educational opportunity.